Our soaps are made of various vegetable oils. 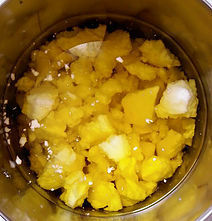 Each vegetable oil contains different kinds of fatty acids, and contributes unique characteristics to the finished soap. Some oils create a lot of lather but don’t moisturize very well while some are very moisturizing but cannot make the soap hard enough. 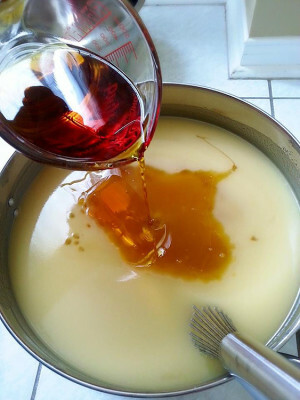 Therefore, a thoughtfully crafted recipe can balance different oils with complementary characteristics, and it is the secret to start a batch of successful and high quality handmade soap. After a soap recipe is designed, I put my goggles and gloves on to protect my eyes and hands from splashes of lye. Then I start to measure oils directly into my big and tall stainless pot. As you can see from the picture, the pot is loaded with both liquid oils and solid oils. I don’t heat my oils. Then, I prepare my soap mold by lining it with freezer paper, measure out the super fat, essential oil blend, natural additives like clays, honey or herbs. At last, I carefully measure out a pot of water and another pot of lye. I slowly and carefully add the measured lye into another pot of measured cold water to make a lye solution. The lye generates a lot of heat while it dissolves in the water. This makes the lye solution extremely hot, hot enough to melt the solid oils. The hot lye solution is then poured into the oil pot. Followed by the most time-consuming part, mixing. I use a huge wire whisk to hand stir the mixture, to help the solid oils melting. When solid oils melted completely, I keep hand stirring it or sometimes I change to a blender to speed up the process. 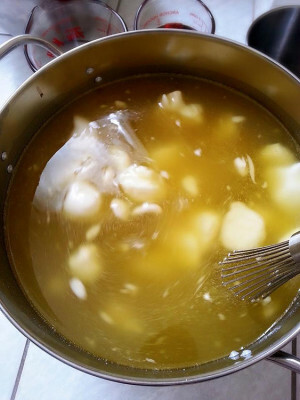 Once start stirring, the mixture begins to change. Oils are breaking down into fatty acids and glycerol, while Lye is breaking down into sodium ions and hydrogen ions. The glycerol from the oil combines with the hydrogen ions from the lye to create Glycerin. The fatty acids from the oils combine with the sodium ions from the lye to form Soap. This chemical reaction is called Saponification. With lots of constatnly stirring, the mixture begins to thicken. I keep stirring and let the saponification process continues until the mixture becomes a really creamy consistency call "trace". That means this mixture is ready for the next step. Once the mixture is trace, it's time to add the extras! Moisturizing super fat, fragrant essential oil blend or natural herbs. Here I have a glass of very fragrant essential oil blend of patchouli, rosemary and clary sage ready to pour in the soap mixture. The extras give the soap an unique personality. 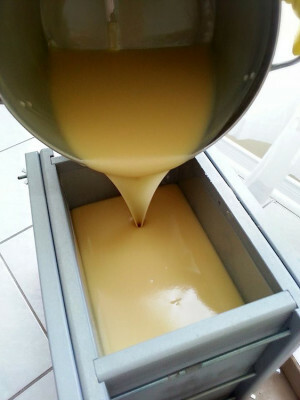 The warm, very fragrant and finished soap mixture is then poured into my large, vertical and pre-lined soap mold. Cover the opening of the soap mold, and place it aside for 24 hours. 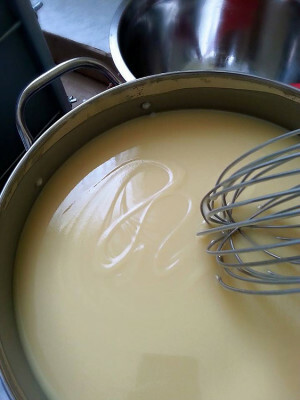 The soap mixture continues to thicken and harden, until the next day it is solid enough to be unmolded and be cut. The next day, I unmold the soap. I use a big grid soap cutter to cut the big soap block into tall logs, then use another single-wire soap cutter to cut the logs to individual bars. I enjoy cutting soap. 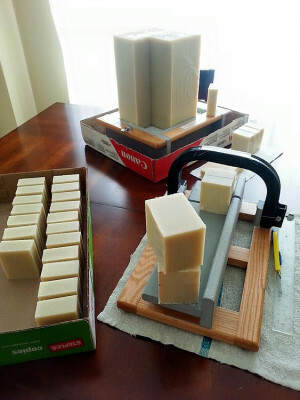 When I cut soaps, my soapmaking studio smells just simply divine! Although those soap bars are cut, but they are not ready to use yet. They are still soft and need time to cure. I lined the bars on the curing racks and let them cure for 4 weeks. This curing period provides enough time for soaps to harden, to be milder and to let the final bit of saponification takes place. 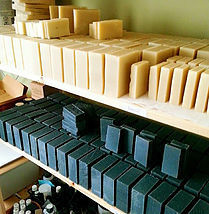 After 4 weeks of curing stage, the soap bars are nice and hard, and ready to use. They contain natural glycerin which is a wonderful moisturizer that makes handmade soap not only gently clean your skin, but also soften it. 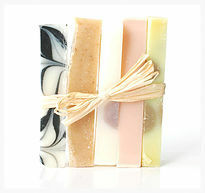 Give our handmade soap a try, and get hooked! Don't be surprised that you start looking forward to daily shower.